Academy of Martial Arts has been offering instruction and training in Tae Kwon Do since 2004 & Hapkido in 2006. The Academy of Martial Arts Systems brings together the energy of the mind and the body. Our program is especially beneficial to children and is designed to enable a child to focus and concentrate on achieving worthwhile goals and to meet life’s challenges with total confidence. Our objective is to provide a fun-filled and positive learning environment for all our young students that will enhance the development of basic good habits such as paying attention, following directions, cooperating with others, respect for self and others, self-control, and self-discipline. Face Painting Artists, Balloon Twisting, Professional Clowns,Comedy/magic shows and more! The library is much more than a place to check out books. We have programs and services for everyone in our community. Come visit us at Backyard Adventures of Iowa Family Recreation Store. We serve the whole state of Iowa and our highest priority is providing the best customer service for you and your family. In our showroom you will find Backyard Adventures Play Sets and Swing Sets, Goalsetter Basketball Hoops, and Outdoor Furniture and Patio Accessories, to meet your family recreation needs. Bookseller chain stocking housebrand eReader, plus a broad selection of titles for adults & kids. They also offer story times and events for kids. Black Eagle Martial Arts in West Des Moines, Iowa provides classes in Taekwondo for all ages, and Hapkido and Kuhapdo for adults. Contact us today to learn more. Don’t just watch a film. Experience the big picture! The six-story dome-shaped screen wraps you in larger than life images that surround your field of view, front-to-back and top-to-bottom. The 12,000-watt digital surround sound system lets you hear everything from a tiny drop of rain to a huge clap of thunder with crystal clarity. From sight to sound, this 216-seat theater is designed to challenge your natural sensory perception with a uniquely immersive movie experience! Bring your group of 10 or more to receive discounted IMAX tickets or give your guests the ultimate movie experience with a theater buyout! 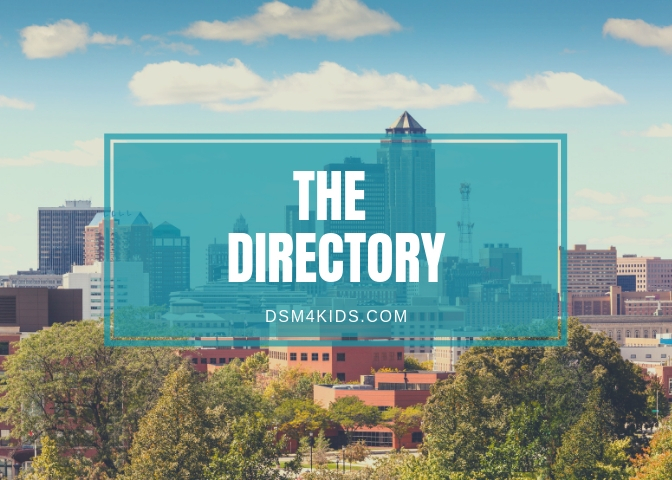 Brekke Dance Center are dance studios in Des Moines and Grimes, Iowa that have provided excellence in dance education to the area for more than 25 years!